The Security Service of Ukraine (SBU) has searched the house of Communist Party of Ukraine leader Petro Symonenko. 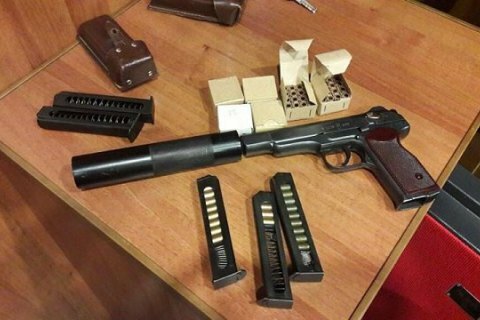 "During the investigative actions, [the SBU] confiscated promotional materials aimed at the violent change and toppling of the constitutional order and seizure of power as well as things looking like a Stechkin pistol with a silencer and 120 bullets to it," the SBU press centre said. According to SBU chief, the Kremlin virus of paid "coups d'etat" found yet another "organism" in Ukraine. Earlier mass media reported that the SBU had detained a Russian national who was working with Symonenko and preparing to set on fire the car of the head of the Ukrainian National Remembrance Institute, Volodymyr Vyatrovych. On 8 May, the SBU searched senior members of the Communist Party in Kyiv and the region and found promotional materials with banned symbols. The leaflets were to be distributed during Victory Day celebrations to provoke clashes among activists of various public movements.